STAR TREK: DEEP SPACE NINE - The Best Trek Cast Ever! | Warped Factor - Words in the Key of Geek. STAR TREK: DEEP SPACE NINE - The Best Trek Cast Ever! 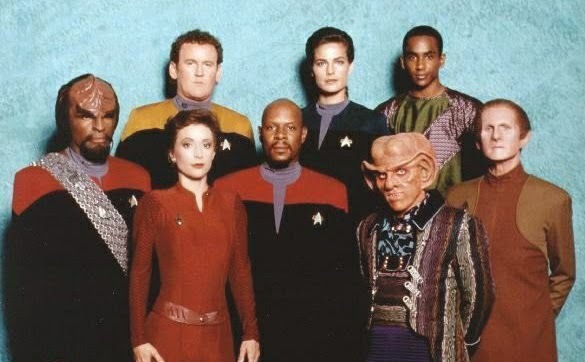 Si Shepherd looks at the cast and characters from Star Trek: Deep Space Nine. Several months before Deep Space Nine premiered in January 1993 I remember reading in, what was likely, Starburst magazine that a Star Trek show would be launching which would be based on a space station, with no USS Enterprise or similar ship to explore strange new worlds. The producers claimed that the show would be darker and possess a harder edge than Trek had ever seen before, there would be conflict from the neighbouring planet's inhabitants and themes of political intrigue. It didn't sound much like Trek to me! As someone who was too young to watch The Original Series first time around but had grown up on repeats of the show, and then gone on to discover and love The Next Generation, it was pure curiosity, and (I have to admit) the inclusion of Next Gen's Captain Picard, that led me to renting the feature length pilot episode, 'The Emissary', on VHS from my local video rental store. Boy, was I glad I did. To this day, Star Trek: Deep Space Nine is the only television show that I purchased (and still own) every one of the VHS video releases - which if I remember rightly was 87 tapes (they reside in my parents loft having been replaced by DVDs) at £10+ a time. A serious investment for my student years. 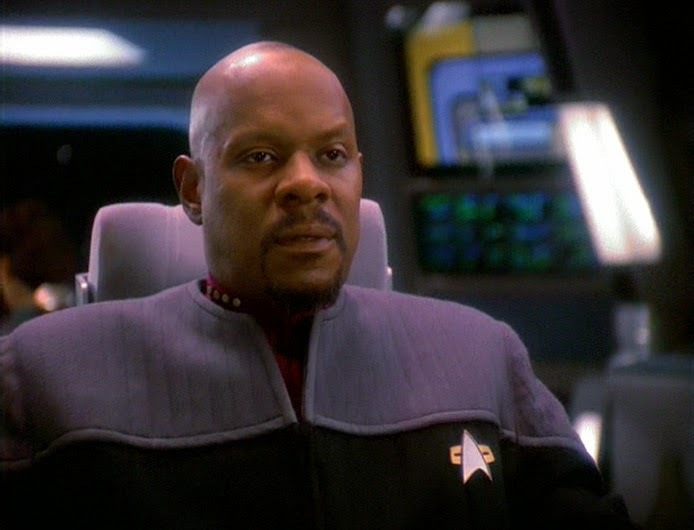 Deep Space Nine has the most satisfying story arc running through it via the Emissary himself, Commander (later Captain) Benjamin Sisko - the first widower in Trek history, bringing along his son to live with him on the space station. There are a multitude of other elements that separate DS9 from any other Trek show, not just because it was set, primarily, in a central location - a space station orbiting a planet yet to join The Federation. There was that suggested political intrigue, resulting from the ongoing conflict between the planet's inhabitants, the Bajorans, and their former conquerors, the Cardassians. 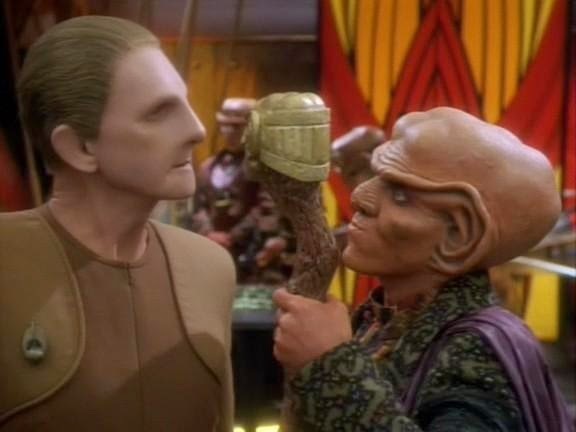 The Bajorans themselves were a highly religious people, though some of the religious leaders featured in the show had some less-than-saintly characteristics and intentions. To add further distance between the other shows, DS9 was located near a worm hole, which would provide for some interesting alien encounters, the first of which occurred in the pilot episode, and set the stage for developments that would continue throughout the show's seven-year run. All these factors led to some of the most intriguing and involved story lines in televised science fiction. Everyone involved, from the main cast, supporting actors, the writers, and special effects team were up to the task in presenting quality viewing week after week. But my main love of Star Trek: Deep Space Nine stems from the inclusion of the most realistic and grounded characters in any of the Star Trek series' ever broadcast. These are people working everyday jobs that just happen to be on a remote space ship. I suppose you could say there are 'soap' elements amongst the characters, because things just aren't resolved in 45 minutes, problems continue as they do in life. So in this first look back at Deep Space Nine, it's the cast I really want to look at (I'll explore other aspects in detail during further articles). DS9 was headed by the authoritative Avery Brooks as Captain Sisko. It may have been headline grabbing when Kate Mulgrew became the first leading female Captain in Star Trek: Voyager, but in DS9 we had the first person of colour to hold such a position on a Trek show, which was a big deal in the early 90s. We sometimes forget how far we've come in the last 20 years regarding acceptance of race and gender within television shows and movies - and I'm aware we still have a long, long way to go. But at a time when most prime time offerings were unlikely to even have a 'token' black character, here was Star Trek showing that the only thing of importance is who the best person for the job is, regardless of race, gender or sexuality. It's a perfect vision of the future that Trek has always adhered to. Sisko was aided by character acting veteran Rene Auberjonois as Odo, the Security Chief, who also happened to be a shape shifter; Nana Visitor as Bajoran Major Kira Nerys, Sisko's right-hand 'man'; Alexander Siddig as Dr. Julian Bashir, a young doctor who would mature greatly during the seven years; Terry Farrell, who played Jadzia Dax for the first six years (with Nicole de Boer becoming the new Dax when Farrell left); and Armin Shimerman as Quark, proprietor of the station's bar and quite the astute businessman. There was also the aforementioned Chief Miles O'Brien played by Colm Meaney; and Sisko's son, Jake, played by Cirroc Lofton. Character development and personal relationships are handled far more satisfyingly and richly in DS9 than in any other Trek series. Chief O'Brien and Dr Bashir seem like genuine friends; and Odo and Quark have a wonderful rivalry, to name but two. So it's much easier to become emotionally attached to the characters. Quark has always been a favourite of mine, Armin Shimerman found the perfect balance for the character, with just the right amount of humour. At the start of the fourth season Michael Dorn joined the cast, reprising his role as the popular Klingon, Worf. It's from here on out that DS9 really jumped to the next level. 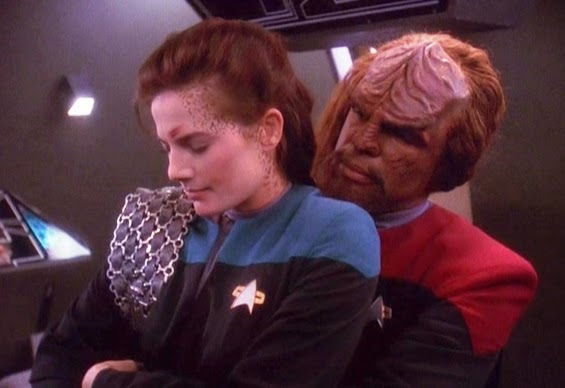 Once Worf arrives, The Defiant arrives, Sisko shaves his head, and The Dominion set their sites on the Alpha Quadrant, the show rarely misses a beat for the next four seasons. 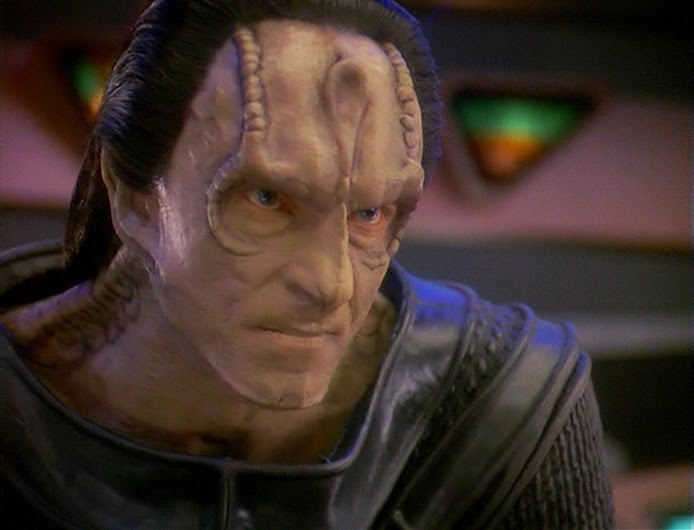 Besides the regular cast there were other actors that had recurring roles that were pivotal to the happenings at Deep Space Nine: Marc Alaimo as the devious and despicable Gul Dukat; Oscar winner Louise Fletcher as the treacherous Kai Winn; Andrew J. Robinson, superb as the Cardassian tailor; Salome Jens, popping up from time to time as the evil female shape shifter; Casey Biggs as Damar, Dukat's subordinate; Aaron Eisenberg and Max Gredenchick as Quark's relatives, Nog and Rom, respectively; Rosalind Chao, wife of O'Brien, reprising her ST:TNG role; J.G. 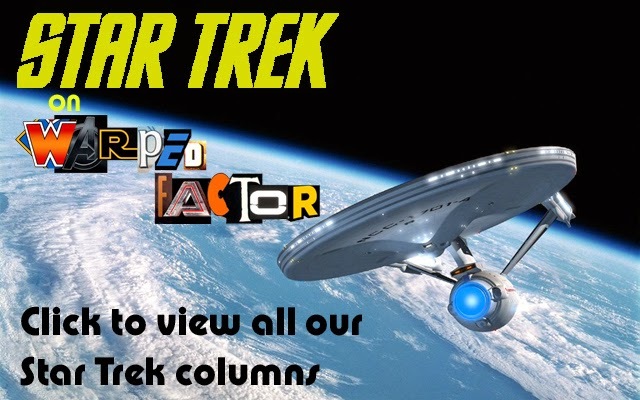 Hetzler as General Martok, an old school Klingon; Wallace Shawn, wonderfully comical as the Grand Nagus; and 60's heartthrob James Darren as Vic Fontaine, a holographic lounge club owner that knows that he isn't real. Each of these recurring actors possessed great talent in bringing their characters to life, especially, in some cases, under heavy makeup. Another memorable character was Morn, played by Mark Allen Sheppard. 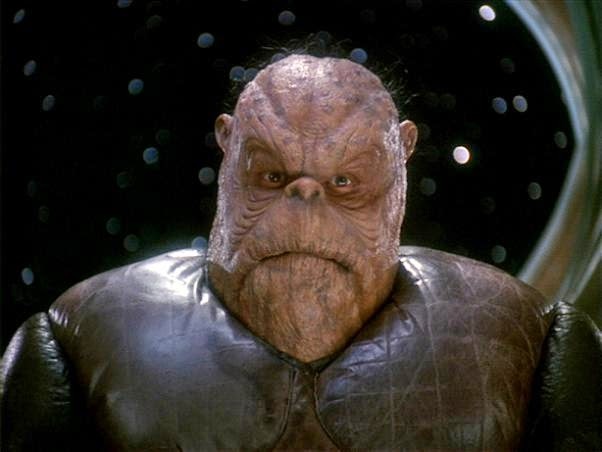 Morn is an anagram for Norm, the barfly played by George Wendt in the TV show Cheers. 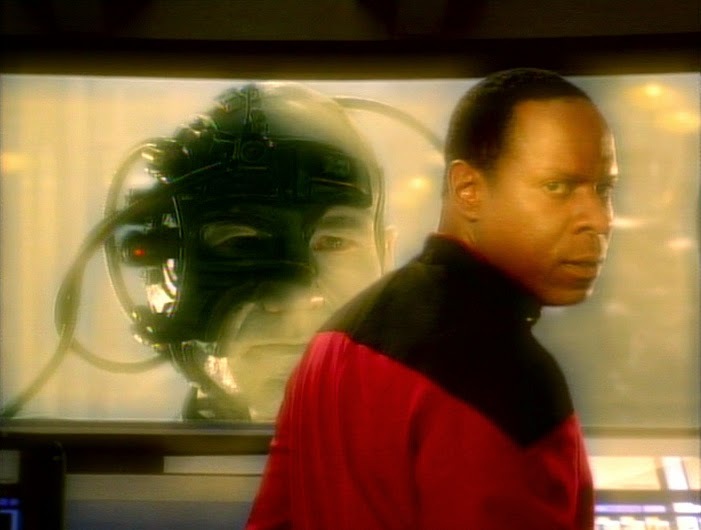 The character never had any spoken lines but was always noticeable and recognized by the crew of DS9, and the manner in which Dax shouts his name upon seeing the hologram at Quark's is reminiscent of the greeting Norm would usually receive as soon as he walked into Cheers. Fans of 24 will likely remember a President and a First Lady in DS9. Gregory Itzen (24's President Charles Logan) had two different roles in the series, playing Hain and Ilon Tandro. 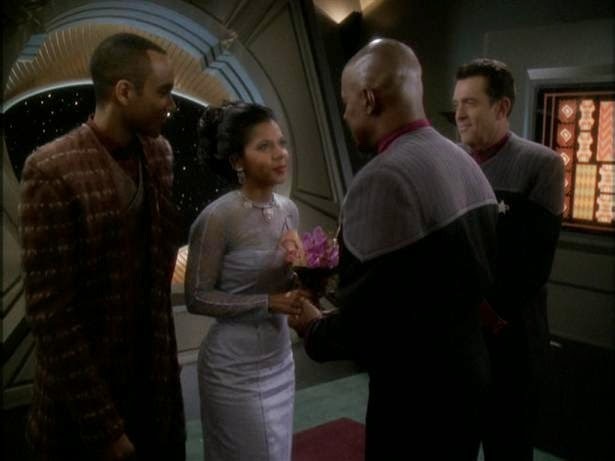 Penny Johnson (24's Sherry Palmer) played Kasidy Yates, a freighter captain who went on to wed Captain Benjamin Sisko. Re-Animator's Jeffrey Combs played two distinctive parts in the series: the Ferengi Brunt and the condescending Weyoun. 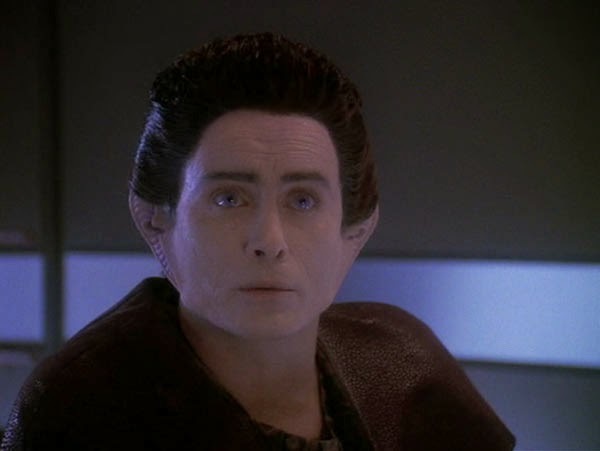 The latter was an especially impressive performance because Weyoun was actually a number of different characters, with each Weyoun being a clone of the original. There was usually only one Weyoun at any one time, with subsequent Weyouns activated following the death of the previous. Deep Space Nine has never garnered as large a fan base as its immediate predecessor, and is often overlooked by many. In fact when promotional advertising was produced for Star Trek: Enterprise, Paramount proclaimed that the new series was about the precendents of Kirk, Picard and Janeway – no mention of Sisko. Even the studio that produced Deep Space Nine overlooked it! I've always felt the problem lies with the fact that DS9 was populated by so very many memorable characters. If you think of the Original Series your mind instantly goes to the duo of Kirk and Spock. For The Next Generation you may think Data before Picard but it's unlikely the good Captain would be any further down your thoughts than that. Voyager and Captain Janeway go hand in hand. But when it comes to Deep Space Nine... well the list is almost endless.